Another one of those magnanimous birds of winter. this is such a special image – rarely do we get to stop the motion of the birds flying away so we can think about it for a moment, usually, like the moment, they are gone. lovely work, thanks for sharing it with us. Thank you for the kind words you have left here, I appreciate them! 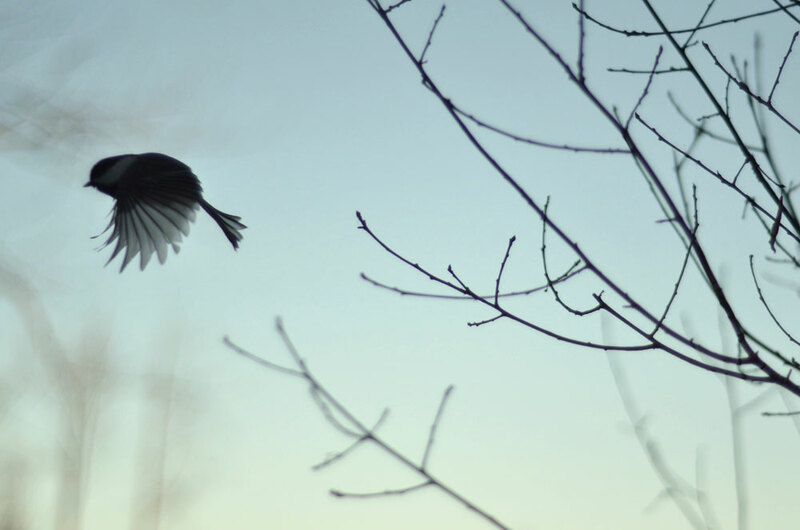 I love the stop-motion shapes of the birds in flight, too. You have this uncanny way of putting us in your work. There I am, aloft! I’ve always suspected you could fly, Brenda! Beautiful egg shell blue, delicate, bird captured at just the right moment. Superb image Karen! Thank you, Adrian. A lucky moment for sure! Sweet and Strong little creatures, so wonderfully “captured”. Winter wouldn’t be the same without them! Thank you, Elena. Ditto what everyone said. Makes me pause for a moment of reflection — I think it’s the mood as well as the little birdie! Too cute! Hi Kay, thank you. I like the mood of it too, and the shape of the body. They are the sweetest little birds. Your photos are incredible. Very romantic, sort of melancholy. I love all of them. That’s a wonderful comment, thank you so much. Yay! Thank you, I’m glad you do. I really love your work. There is something very haunting and dreamlike about your images. Unsettling perhaps! Thanks very much for the nice feedback. I like all the adjectives you’ve chosen, including ‘unsettling’! Superb. I wish I could take shots like that! Thank you, Rachel. Perhaps you could! : ) I was using the camera on high speed continuous mode (shutter) to freeze the movements. I’m glad you like it. They are incredible creatures. Thank you. It really is. We are lucky to live in a world with these little creatures. You have captured a beautiful shape and with the colours as you have shown very subtle and lively. Makes the eye dance. ‘Makes the eye dance’ – what lovely idea that the image can make the eye dance. Thank you, Steven. Beautiful capture of the wing feathers, and the background colour echoes the delicacy of the bird nicely! Thank you, Katrina. The whirr of the wings near your ear is charming also. Thank you, Anette. They are endlessly charming. Amazing shot, it couldn’t have been better!! Such a lovely act of benediction in you work. Exquisite. Absolutely gorgeous – how long did you have to wait to capture this, Karen? Thank you, Richard. It was near the end of my walk so I guess it took a while. It was my favourite photograph of the day. Such delicacy in both the bird and the tree. You never disappoint, Karen. Hi Ashley, that’s exceptionally kind, thank you. This is just gorgeous. I absolutely adore your photography! I love the light and detail on the wings. Beautiful moment, Karen. hi Philip, thanks for your comment, I’m glad you like it. Our time flies whitout leaving a trace. …the picture really is wonderful! Perfect timing to snap the bird in flight.